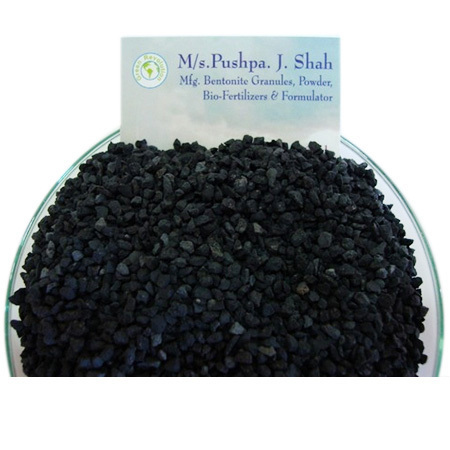 These are black (Roasted) granules made of Bentonite clay. Due to its under mentioned characteristic they are widely used as carrier in formulation of pesticides, herbicides, fungicides, bio-pesticides, Plant Growth Promoters and Bio-fertilizes. 1) Have a high liquid holding capacity. It remains free flowing after absorbing 15 to 20 % liquid. 2) It acts as a preservative of active ingredients. It saves the technical ingredients from the direct ultraviolet rays of sun. It does not react with the technical material because it is inert. 3) It is made of natural mineral clay so it is non-hazardous and non-alkaline material. 4) After it comes in contact of water it releases the active ingredients slowly over a long period of time hence reducing the chances of wash out in heavy rain or water logging condition. 5) As it is roasted at 700 degree temperature, material becomes inert & sterile which is preferable for Microbial products as it prevents the chances of contamination and increases the shelf life.